This is the first article about the Animal Planet event in North Carolina that seems to be written from the researchers perspective. Matt Moneymaker and Cliff Barackman are quoted regarding the methodology and evidence found. "We're going to do an evidence search in a grid," he said. "We doubt you're going to run across Bigfoot out there, but we are going to be looking for some evidence. There's been a lot of sightings in the Uwharrie National Forest. --Matt Moneymaker"
"A lot of people would see this as the front part and back part of the foot, but I think we're looking at a quadripedal animal here," Barackman said. "I think this is probably a deer. --Cliff Barackman"
ALBEMARLE, N.C. -- Around 300 people gathered last weekend at the Eldorado Outpost in Montgomery County on what many might call a fool's errand - a search for Bigfoot. 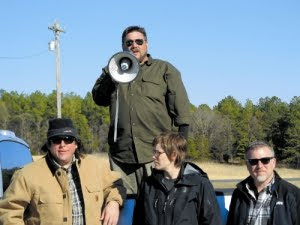 The expedition into the Uwharrie National Forest to hunt for the elusive creature was led by longtime Bigfoot researcher Michael Greene, Bigfoot Field Researchers Organization leader Matt Moneymaker and a team from the cable and satellite TV channel Animal Planet. "This is about the crowd I expected," Greene said. "We're going to assemble out there and spread out as a group." Wally Hersom of the Bigfoot Field Researchers Organization holds a Bigfoot cast made from a footprint in Walla Walla, Wash. The group led a search in North Carolina last weekend. While most members of the crowd had shown up to volunteer for the search, a number of individuals were caught up in the search by accident. Brandon Tysinger and Joey Boslet from Calabash and Scott McKinney from the Myrtle Beach area were camping in the Uwharries and heard unexplained sounds outside their tent Friday night. They thought it was strange, but did not connect it with Bigfoot until they found out about the search on Saturday, they said. "We pulled up at the gas station, and all of a sudden, we're looking for Bigfoot," Tysinger said. "We want to know what in the world it was in the woods last night, so we thought we'd go, too." "We just kind of showed up," McKinney said. Others in the crowd showed up for entertainment or to confirm their belief or disbelief in the legendary creature. "I'm here for the fun of it," said Brittney Huneycutt of Albemarle. "This is a once in a lifetime thing." "I'm very skeptical," Adam Loflin, of Norwood, said. "I'm leaning toward the fact that he's not out there." Before the search began, Moneymaker addressed the group gathered at the outpost. "We're going to do an evidence search in a grid," he said. "We doubt you're going to run across Bigfoot out there, but we are going to be looking for some evidence. There's been a lot of sightings in the Uwharrie National Forest." The researchers, film crew and volunteers left the outpost at around 3:15 p.m. and walked approximately a quarter of a mile down the road to a field at the edge of the forest, where Moneymaker gave further instructions. He encouraged the volunteers to look for signs of Bigfoot, such as footprints, hair samples, broken tree branches and stick structures. James Ackerman, of the Badin area, discovered tracks by a shallow creek that looked almost human. "I was just jumping over the creek, and as soon as I jumped, I saw a footprint, and I yelled, 'Footprint,'" Ackerman said. Animal Planet researcher Cliff Barackman was called in to look at the footprint. "A lot of people would see this as the front part and back part of the foot, but I think we're looking at a quadripedal animal here," Barackman said. "I think this is probably a deer." When Moneymaker arrived on the scene, he disagreed and said that it was possible that the prints were made by something else. A little further down the stream, a deer carcass was found. The researchers gathered around the carcass discovered gnaw marks on the bones. According to Barackman and Moneymaker, deer is Bigfoot's main source of food. "That's exactly what a deer kill looks like," Moneymaker said of the carcass. "A Sasquatch [Bigfoot] will grab the front leg and break it. The break has a particular look to it, and that's exactly what I saw there." In the end, Bigfoot didn't make an appearance, but the show goes on. In this case, the six-part Animal Planet series is planned to air in the fall. I never ever miss a single thing I can find about BF, so I will be watching. I don't expect miracles, but I would love to hear intelligent conversation. I find that BF is a lot like the ghost hunting world and you have your "believers" who take it like a religion as far as towing the same old lines about what it is and how it works. I like people that look at it asking lots of questions and looking outside the box. I did a post today that kind of attacks the Patterson-Gimlin film but also gives it credit where due. In the end, we get nowhere if we don't look at our own belief systems and self explanatory style and the context in which something happens; those are the most critical elements for objective review. I just watched the show. It was ok.
my wife and i just finished watching the florida episode and 1st why not stay at 1st place with couple??? ?u had a good ir site b/4 bo bo took a seat thump down the stairs.set up critter cams all around,sit and wait.u even got a response from bo bo's 1st shout,then u guys pick up leave to go 100's of miles down south for info from seminoles that anyone would know from 1st time u watched anything on a squach.we see this going like destination truth etc.get some one on the hook,then the script go south.another stinker!!!! !unless something truely changes! I just wished there were not so many commercials in-between as it shows you don't have enough footage to run a full hour...hum? I would like to see something on camera or your Camera actually finding a Squash in the infra red lights, anything would make it more real.